The government shutdown has Americans feeling pessimistic. The past couple of months have been rocky for the US economy. The stock market has been volatile, and remains below where it was in early November 2018. Productivity has slowed. And now, the country is in the middle of a partial government shutdown that has lasted nearly a month, leaving many federal workers without paychecks, and threatening to delay mergers and initial public offerings. Economists expect the shutdown to take a bite out of GDP growth (paywall). Americans are feeling it. 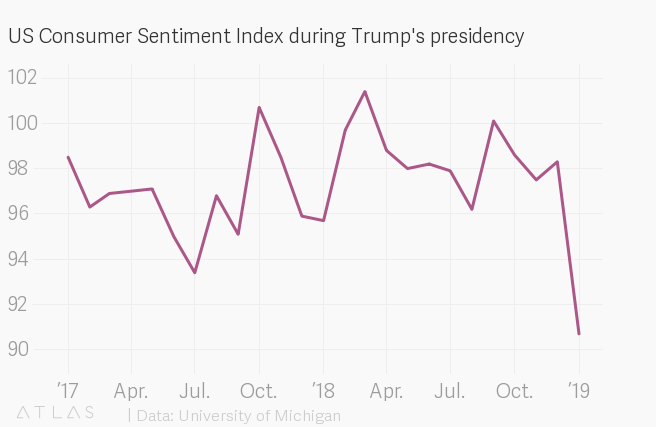 The University of Michigan’s Consumer Sentiment Index fell to its lowest point of the Trump presidency, with a score of 90.7 in January, according to preliminary data released yesterday (Jan. 18). The index is based on monthly interviews with over 500 people who are representative of the US population on their beliefs about their personal finances and general business conditions. The index is predictive of future inflation, unemployment, and consumer spending. “[The decline] was due to a host of issues including the partial government shutdown, the impact of tariffs, instabilities in financial markets, the global slowdown, and the lack of clarity about monetary policies,” writes Richard Curtin, the survey’s chief economist. If you take a step back, though, the current level of consumer confidence doesn’t look so bad. 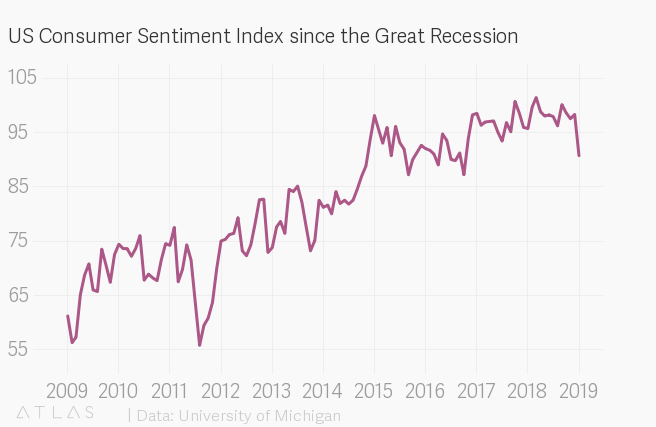 The Consumer Sentiment Index is still far higher than it was in the years following the Great Recession. The index fell below 60 as recently as 2011. So yes, consumers are more worried than they have been in the past couple years, but it’s far from a crisis of confidence. If the politicians in Washington, DC can manage to fully reopen the government, optimism could quickly return.